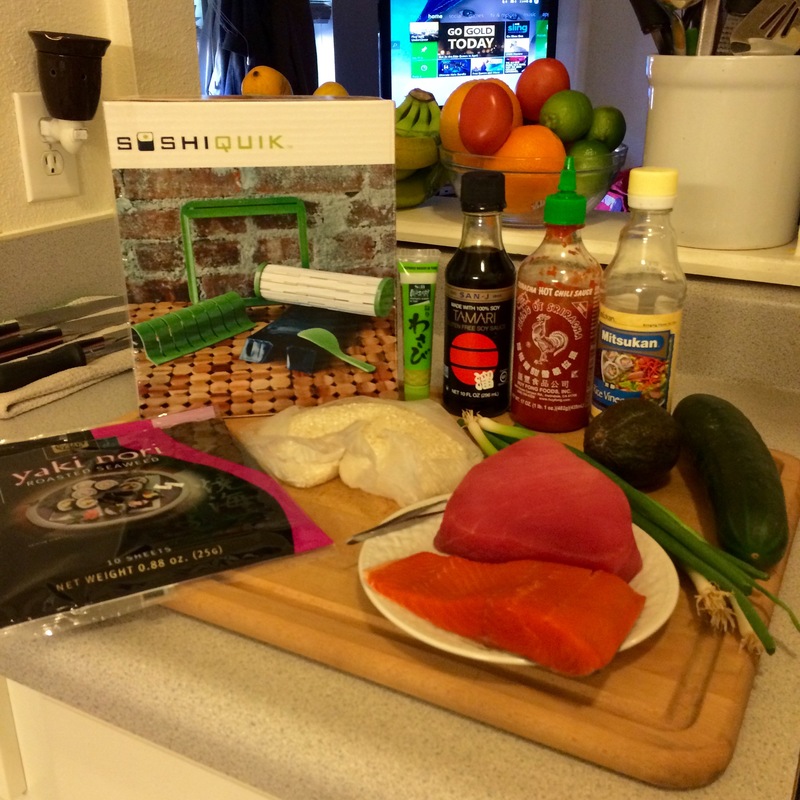 I received a free SushiQuik Starter Kit for my review. 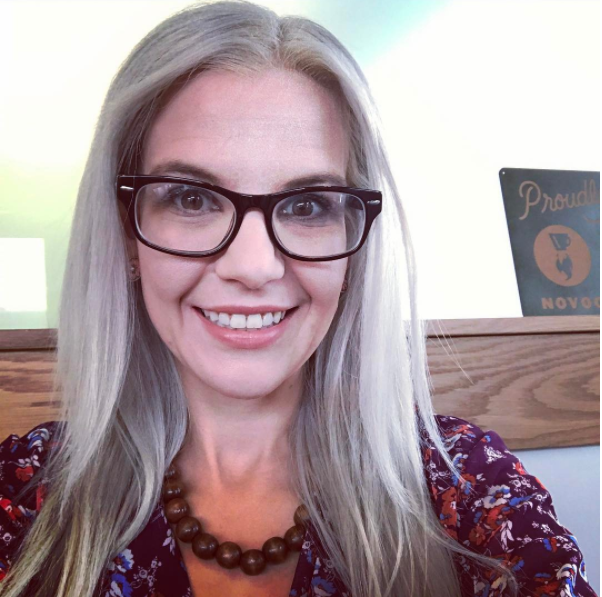 I received no other compensation and all recipes and opinions are 100% my own. D.J. and I LOVE sushi. When we first met in Florida, we would frequent our local sushi restaurant at least once a week. It was always our go-to restaurant, and where we always celebrated our birthdays. Once Anthony was born it was harder and harder to get to the sushi restaurant and now it seems that getting sushi is a treat for us, and something for a special occasion, so when I was given the opportunity to try SushiQuik, and make sushi at home, I knew I couldn’t turn it down. I emailed D.J. right away and started planning my grocery list. Mostly everything you need to make sushi is available in the international foods aisle of your local grocery store or even at Walmart. But if you want to be adventurous, and save a few bucks, head to your nearest Asian grocery store to pick up your ingredients and check out all of the different foods that you wouldn’t normally see – pigs uterus, anyone? 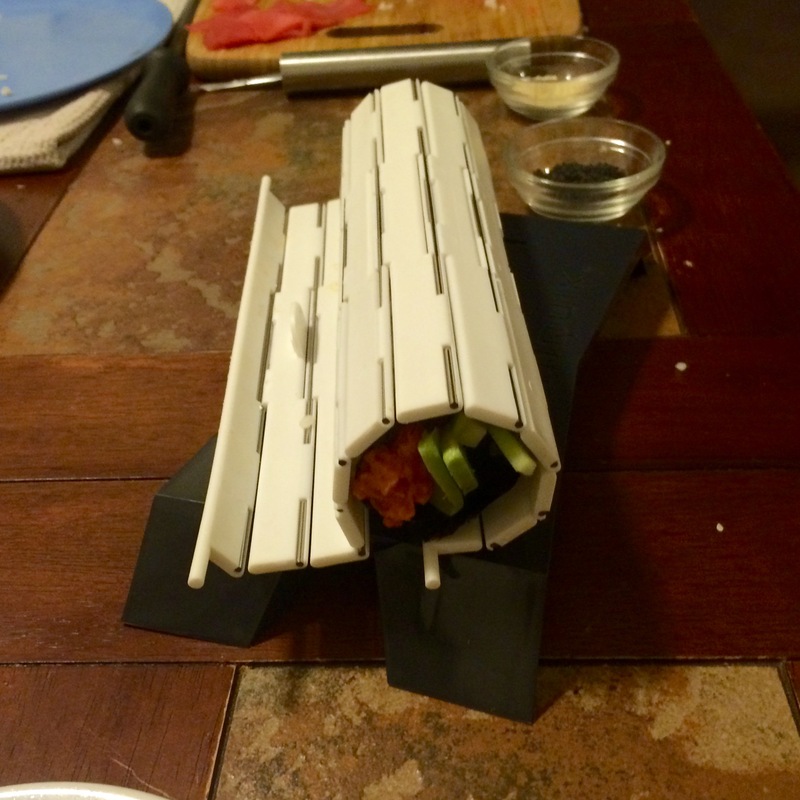 We bought both salmon and tuna to make sushi, but then later decided to use the salmon to make dinner the next night. 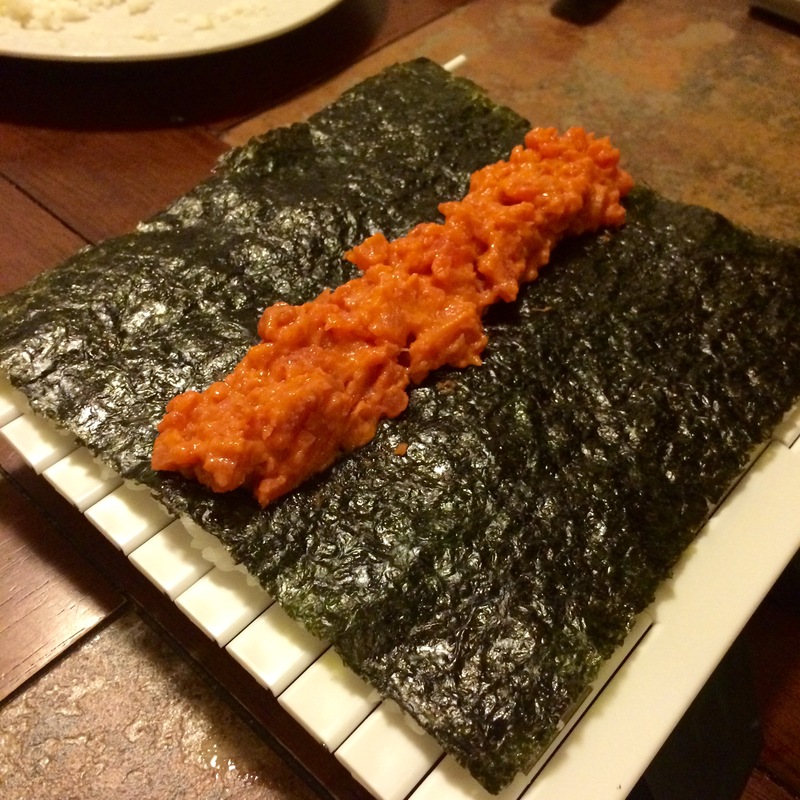 We decided to use the SushiQuik to make Spicy Tuna Rolls. Since Anthony isn’t a fan of sushi quite yet, we couldn’t have sushi for dinner, so we ate early and after Anthony went to bed, we decided to make our homemade sushi making experience a date night. 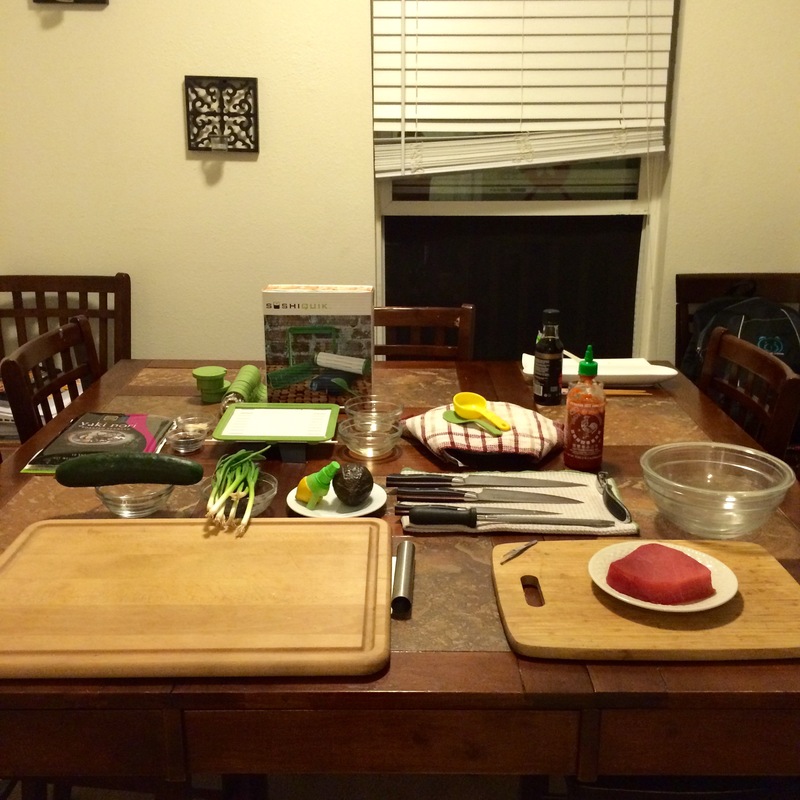 Because there is no cooking in sushi (after you’ve made the rice), I moved our cutting boards, knives, the SushiQuik, and all of the ingredients to our kitchen table, and we “cooked” side by side, preparing, rolling and eating sushi. The first step in making sushi is making sushi rice. I found it to be pretty easy, but everyone seems to say it’s terrifying. Rest easy my friend. This foolproof method of cooking your rice on the stove top works every time (even up here at high altitude). When I worked at Sur La Table, and we taught sushi making classes, this is how the chef made it, and it always worked. 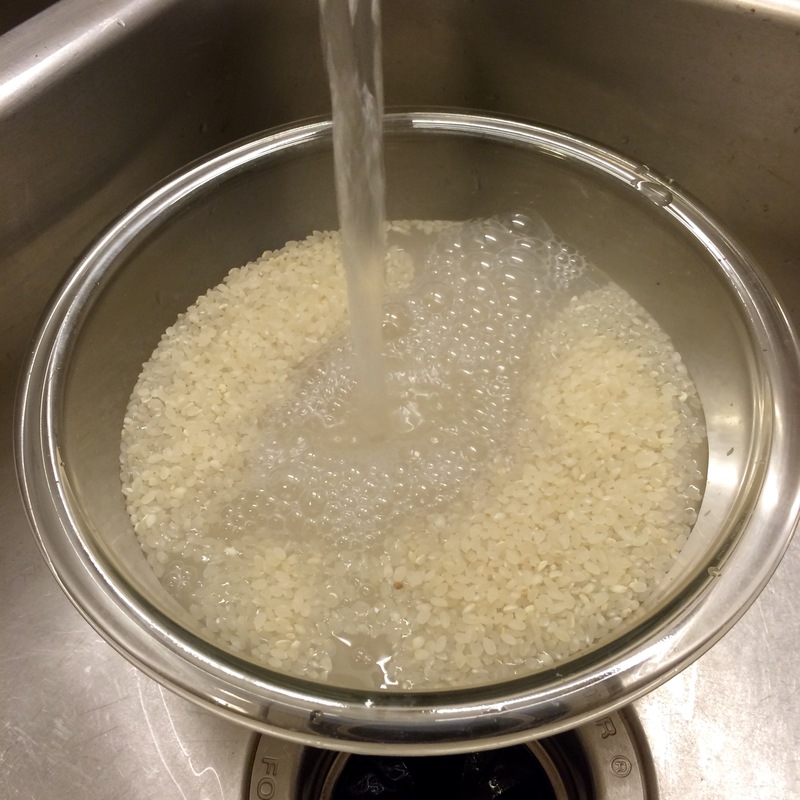 Place rice in a large bowl and add cold water to cover from the tap. Gently stir the rice with your fingers and then drain in a fine mesh strainer. Return the rice to the bowl and add more water to cover. Stir and drain again. Repeat this step two or three more times. Traditionally, sushi rice is rinsed until the water runs clear. Transfer the rinsed rice to a large pot (that has a tight fitting lid) and add 1 3/4 cups water and stir. Set the pot over high heat and bring to a boil. Reduce the heat to low, cover, and cook until all of the water has been absorbed and the surface of the rice is dimply – like a golfball. It took me about 12 minutes. Remove the lid after 10 minutes and check. Rice takes about 10-14 minutes to cook. Remove the pot from head at allow to stand covered for 15 minutes. Meanwhile, while the rice is cooking prepare the rice vinegar by stirring together vinegar, sugar and salt until dissolved. To finish the sushi rice, rinse the paddle with cold water and use it to transfer rice to a large, shallow bowl or platter – preferably wood. 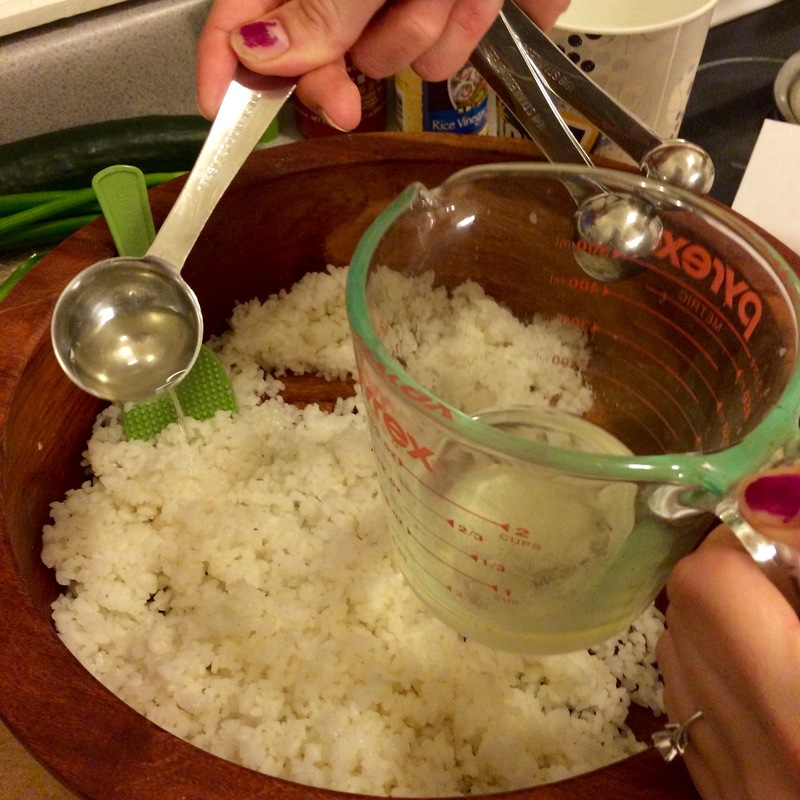 Rinse the spoon again to keep the rice from sticking to it, and gently fold the rice repeatedly. As you fold, use your other hand to fan the rice with a paper fan or something similar. I kept a small glass of water beside me at this part so that I could rinse my paddle when fanning the rice. After about 5 minutes of folding and fanning, the rice will be tepid. 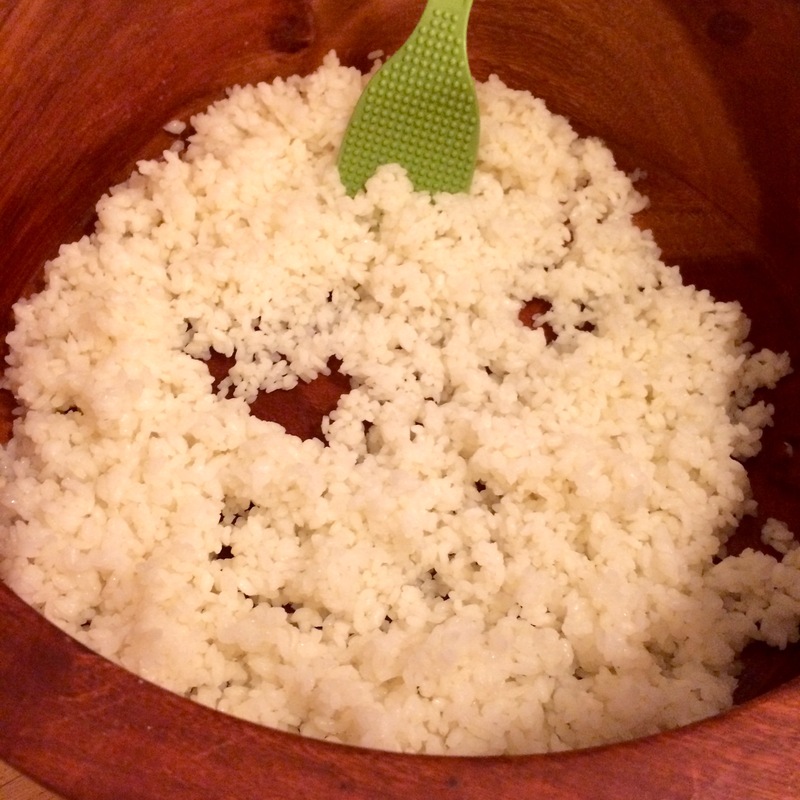 While continuing to fold the rice, gently and quickly add 1 tbsp of vinegar mixture into the bowl and distributing each addition evenly before adding more. Stop to rinse the rice paddle with water as needed to keep the rice from sticking to it. Finally, continue folding the rice until it has a glossy sheen – about 5 more minutes. Cover the rice with a kitchen towel and let stand at room temperature until ready to make the sushi rolls. Keep away from foil or plastic wrap, because they will trap in the moisture and make your rice gummy. Keep the rice out of the fridge too, or it will harden. 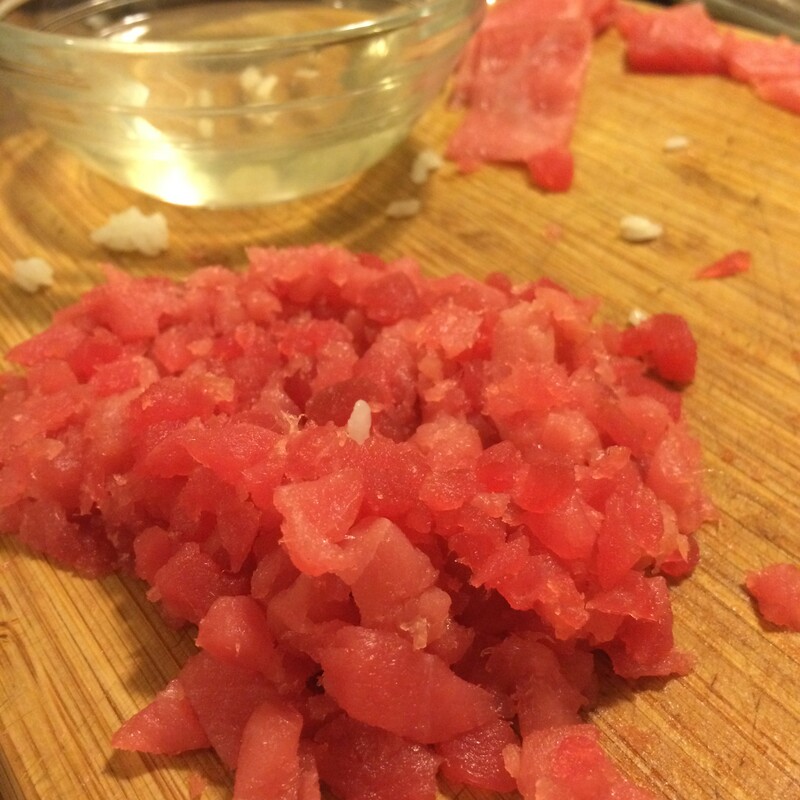 After you’ve made your sushi rice, it is time to prepare the tuna (or whatever fish you’re using), and the vegetables. D.J. and I initially each took on a task; he cut the tuna and I cut the veggies… but we somehow each ended up taking turns, and doing both. 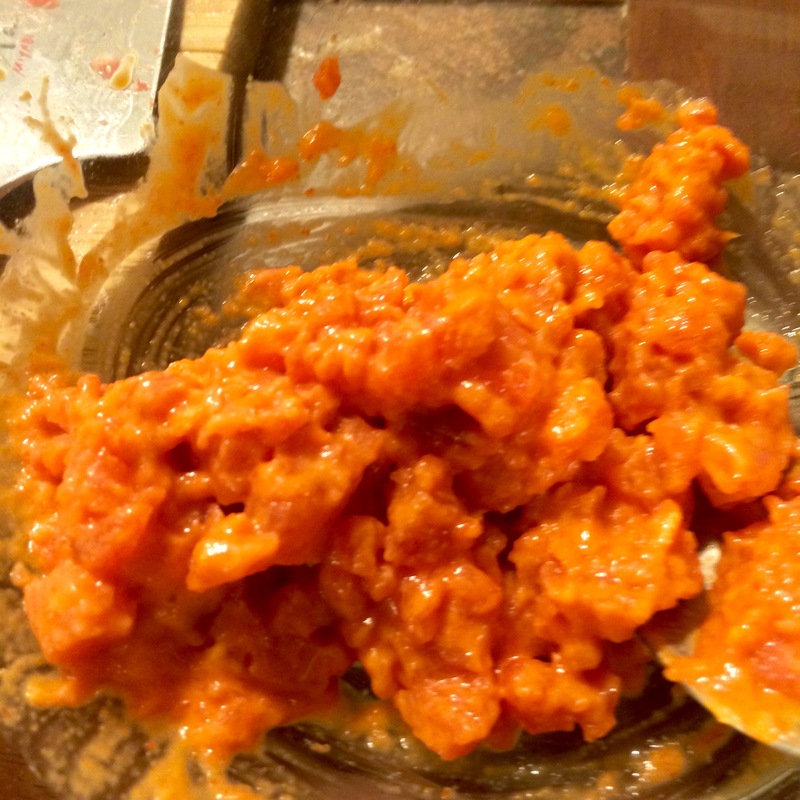 To prepare the spicy tuna filling, combine the mayo and sirarcha. Whisk together and set aside. Next, prepare your vegetables. 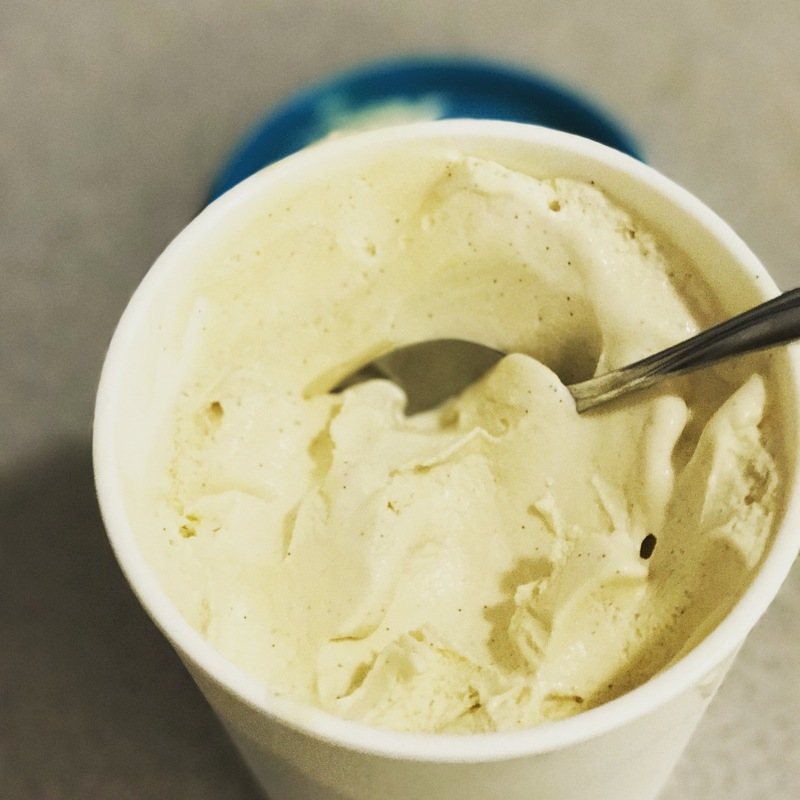 We used cucumber and avocado. 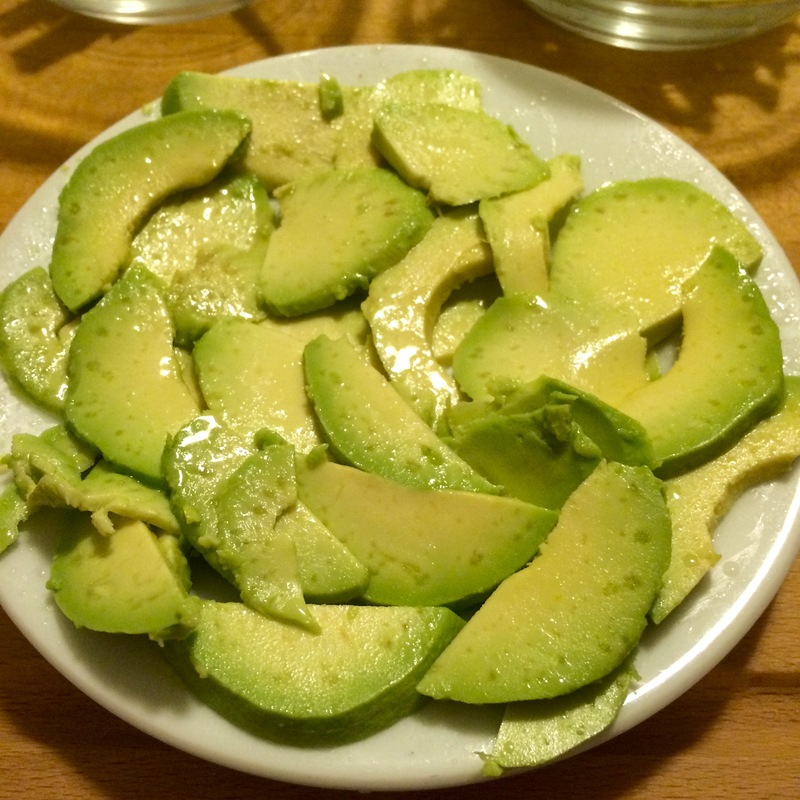 Slice avocado into thin slices, and lightly cover with lemon juice to prevent from browning. Remove skin from cucumber, slice in half and remove seeds. 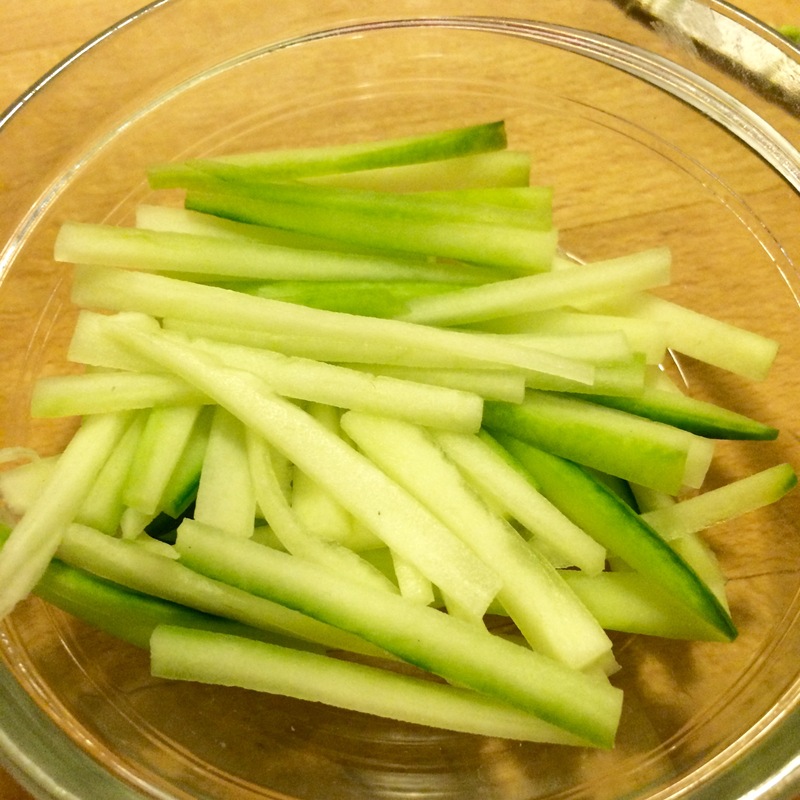 Cut cucumber into 3″ matchsticks. 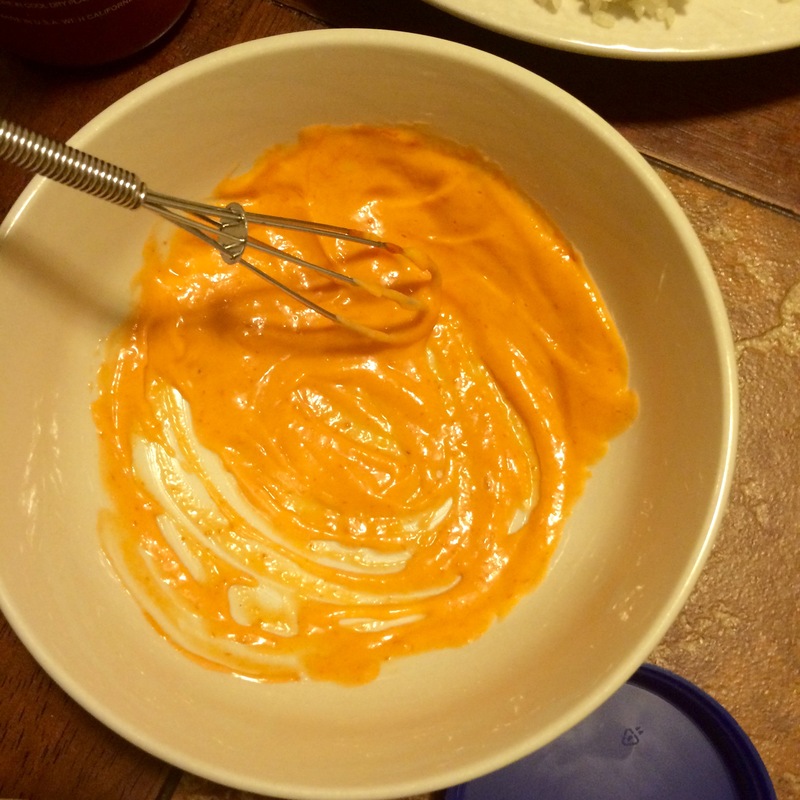 Add spicy mayo to tuna, and gently mix together with a silicone spatula. And now the part that before I used SushiQuik seemed the hardest, but was really, quite easy! 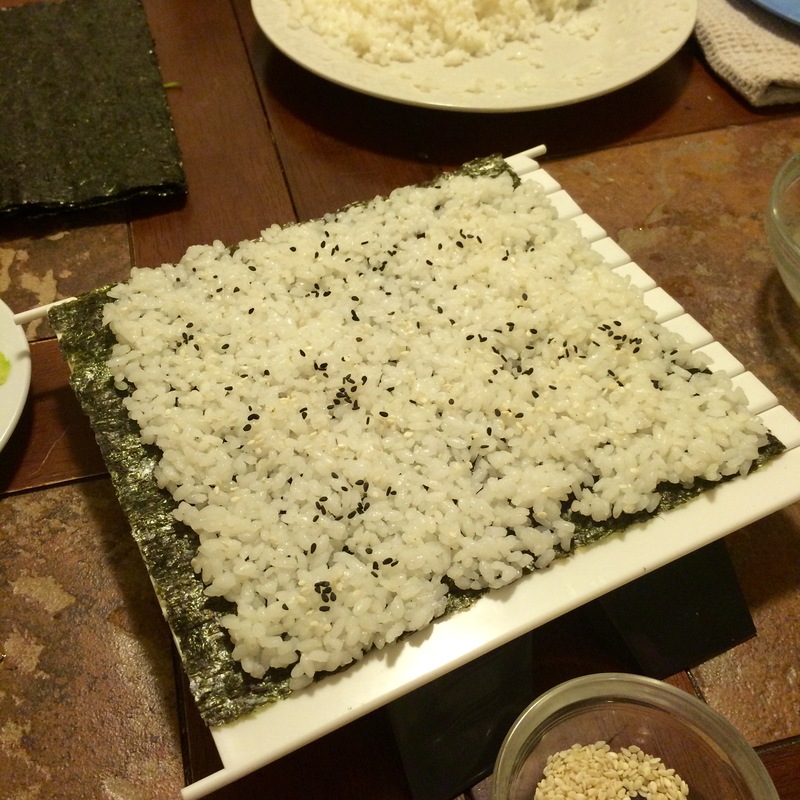 Place the sheet of nori on the white mat with the rough side facing up. The rice will stick to the nori better this way. Then, just simply place the guide on. 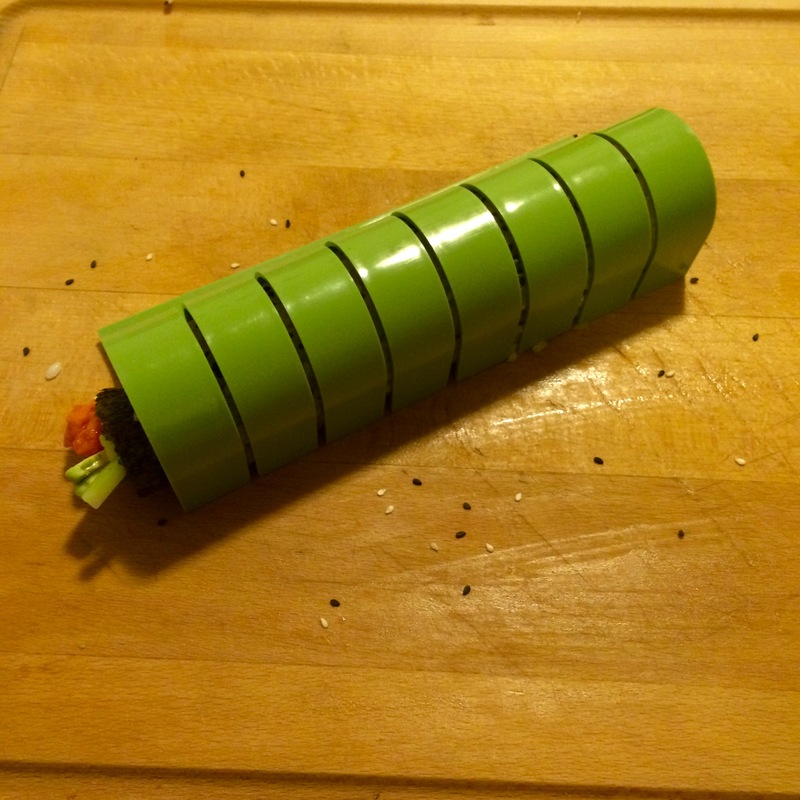 It’s pretty nifty… the guide helps you put just the right amount of rice on your sushi roll! 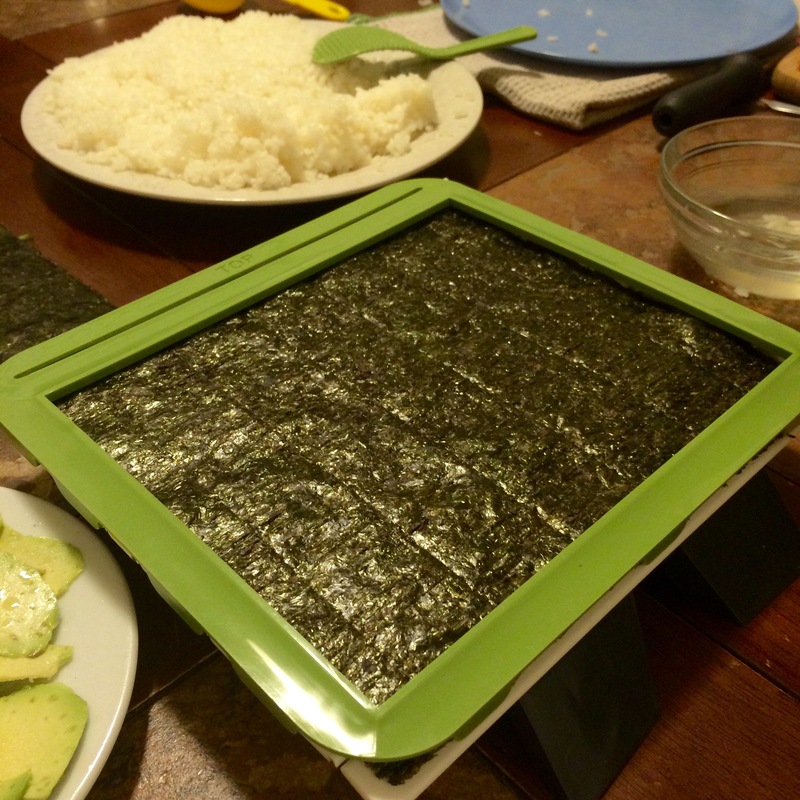 Using the green paddle that comes with the SushiQuik kit, gently add about 1/4 – 1/3 cup of prepared sushi rice to the nori. We ended up just using our fingers. It was a lot easier. To make sure that the rice doesn’t stick to your fingers, create some hand vinegar which is simply 1/4 cup rice vinegar and 1 cup of water. 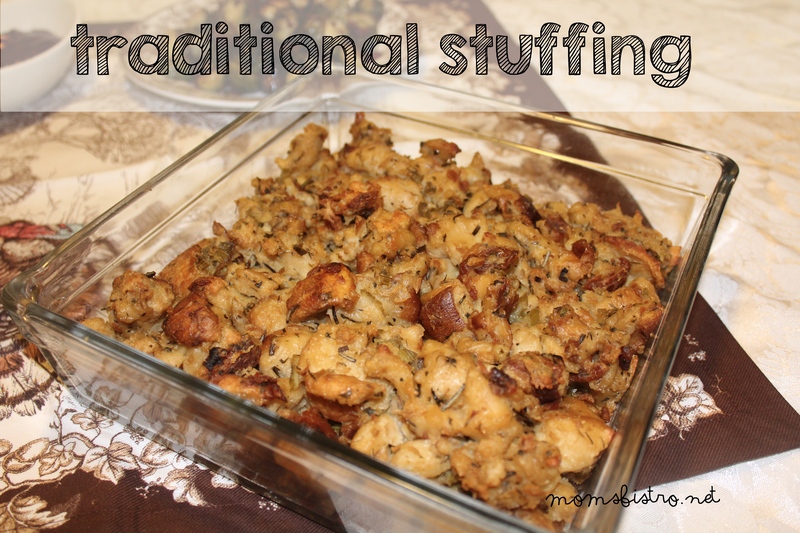 Use this to dip your fingers in while working with the rice. Spread it out to the edges of the guide. Let the rice just fall where it will and don’t force it, or you may tear your nori. 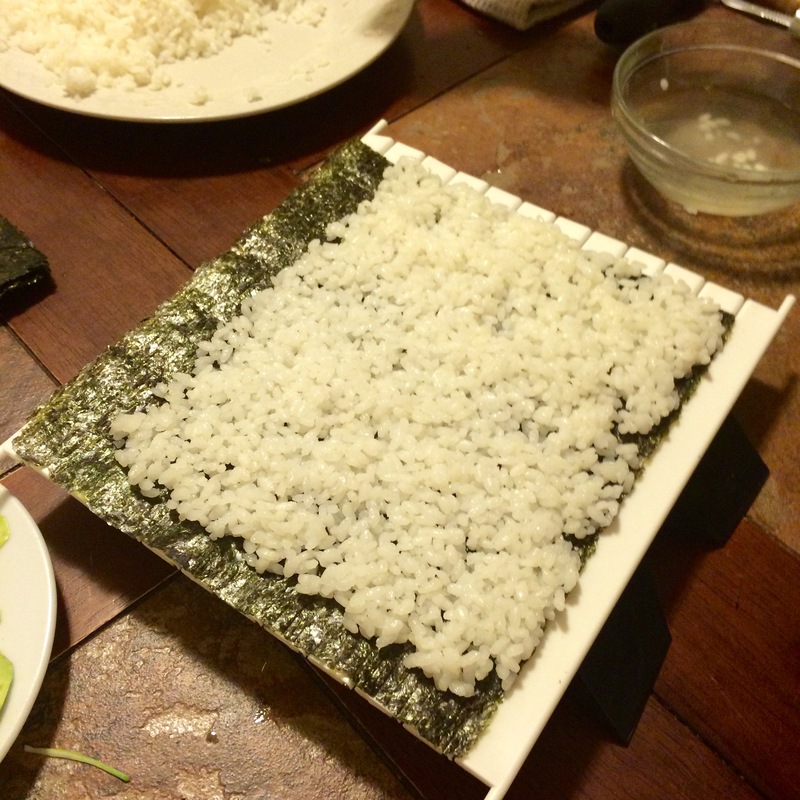 Remove the guide, and marvel in your perfectly even square of sushi rice. We noticed that the rice doesn’t go all the way to the edge, so we added some more rice to even it up. 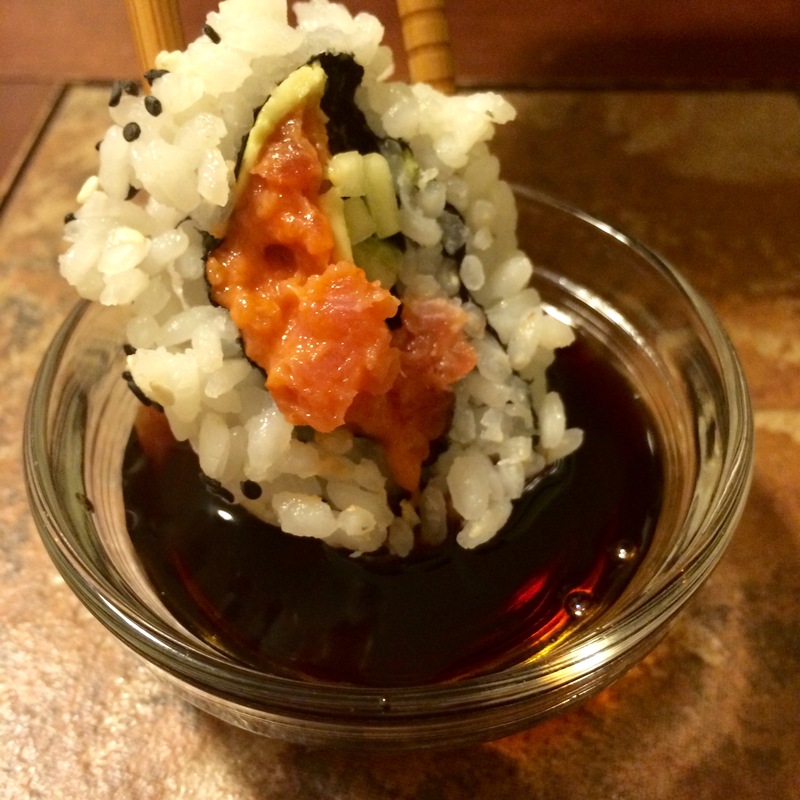 Since Spicy Tuna Rolls are inside out rolls, we added some white and black sesame seeds. It’s completely optional, but made them look pretty! Now this is what seemed to be the trickiest part, but isn’t too bad. 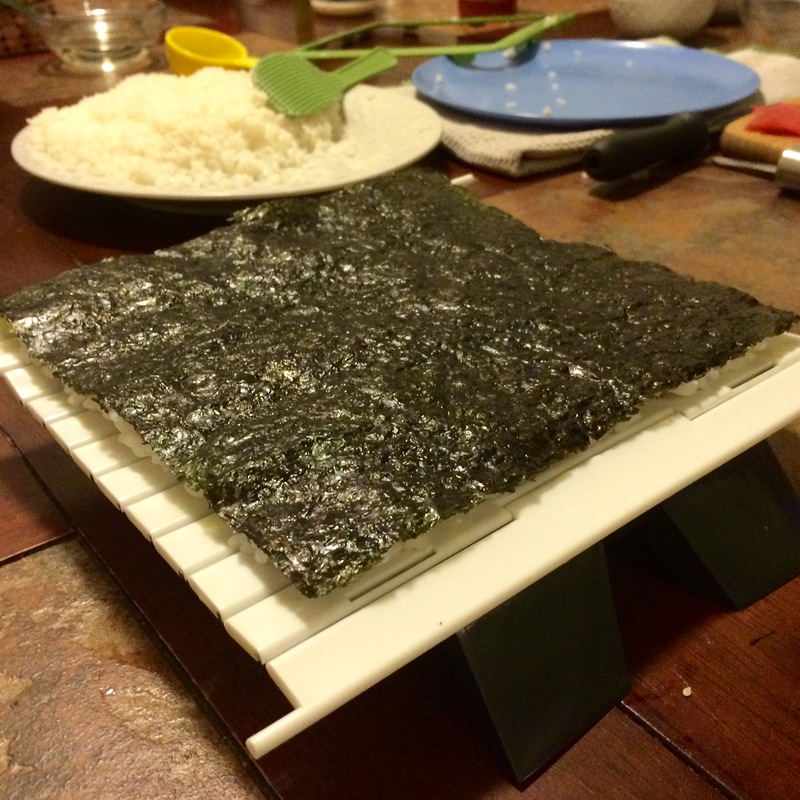 Gently slide the nori sheet off of the white mat, and remove the mat from the stand. 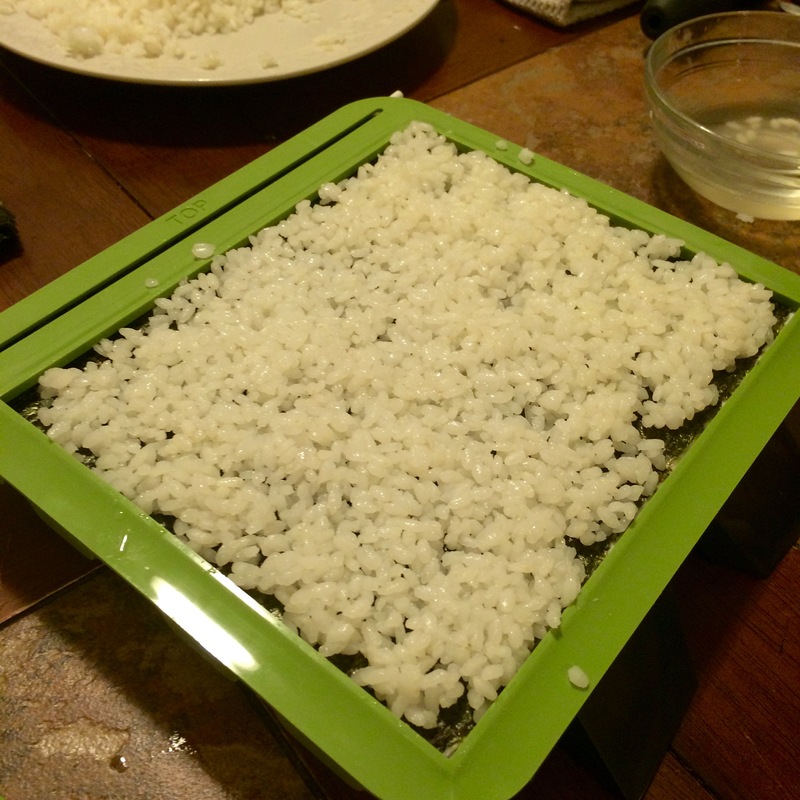 Flip the mat upside down so that the tab to hold it on the base is facing up, and place the mat on top of the rice, so that the shiny part of the nori is facing up. Gently place the white mat back on the base. 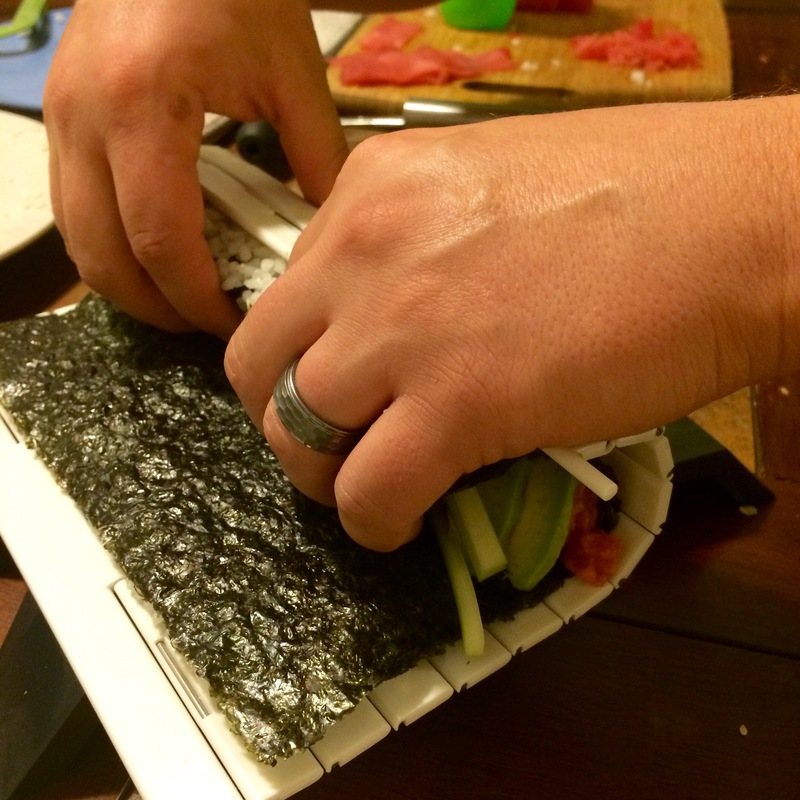 Using a spoon, add a long thin horizontal strip of spicy tuna filling across the center of the nori. Lay slices of avocado across the top of the tuna filling, and place cucumber matchsticks horizontally along the side of the tuna. 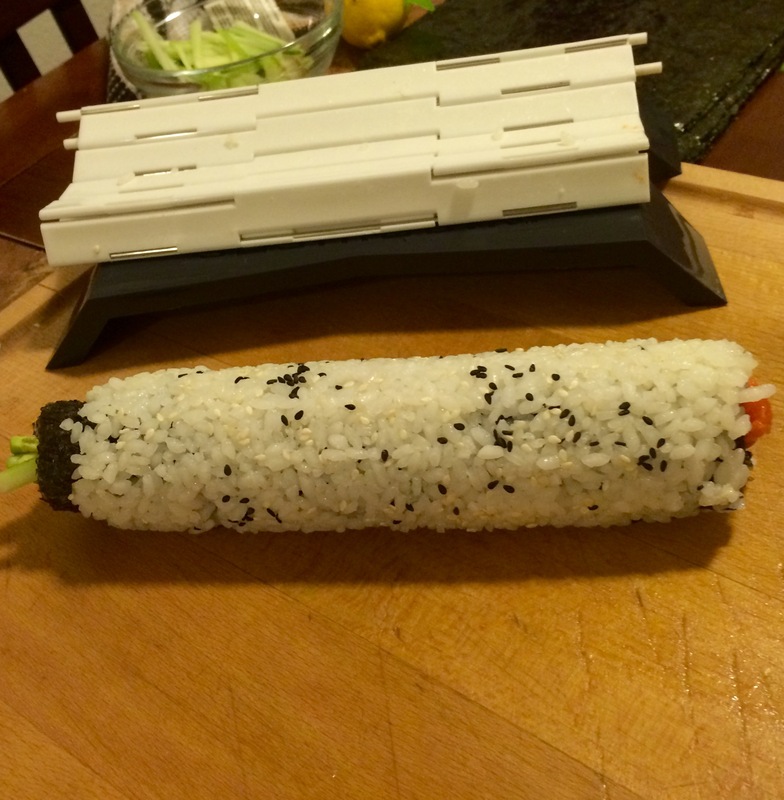 To roll sushi, pick up the edge of the mat nearest you with your thumbs and slowly lift the rice covered nori around the filling, pressing gently against the white mat to secure the roll. While raising the edge of the mat, continue rolling forward to complete the sushi roll. Grasp the roll again and press firmly on the mat to finish shaping the roll. Carefully remove the mat and allow the roll to stand 3-5 minutes before moving to the next step. 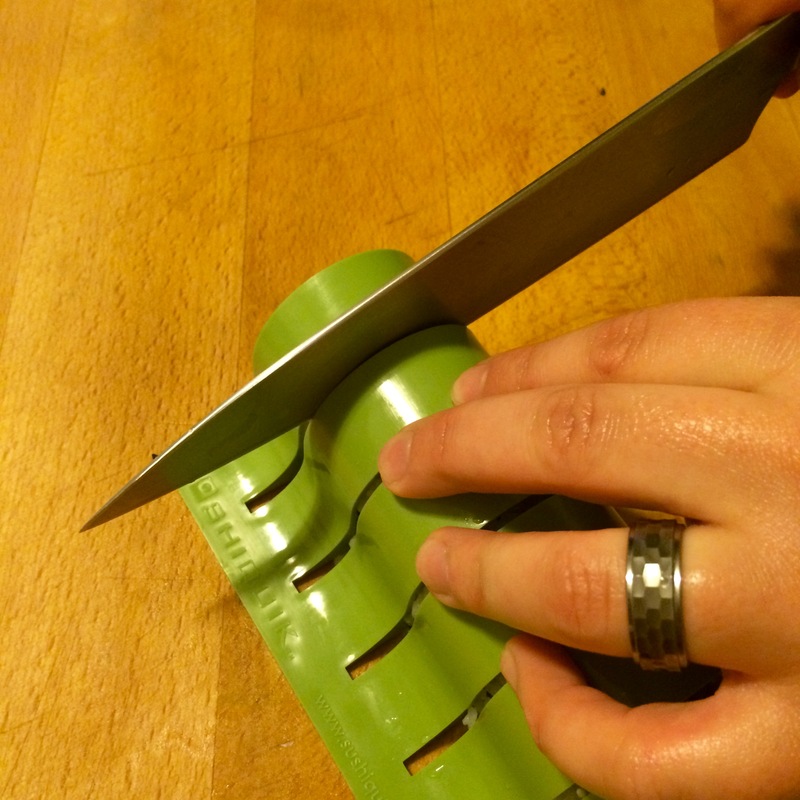 Place the cutting guide over the sushi roll, and with a sharp knife, slice into 8 even pieces. Using a very sharp knife is extremely important. To keep the knife clean in between slices, use a damp towel to wipe the blade. Arrange the slices cut side up, on a platter and serve with small bowls of with soy sauce, pickled ginger and wasabi. 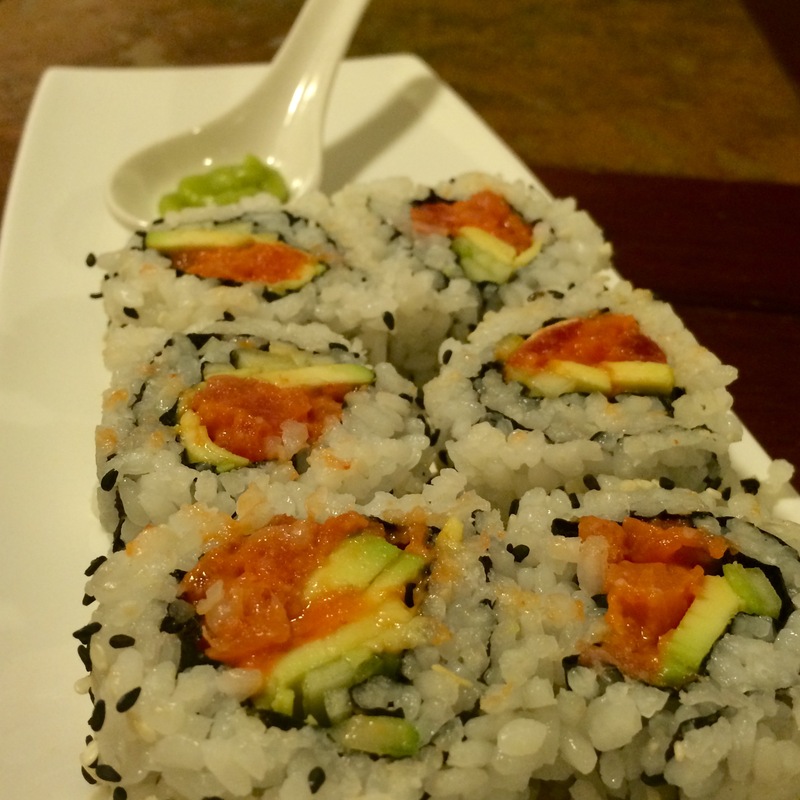 Overall, I was very, very impressed with the simplicity of SushiQuik. The guide seemed to miss a few spots on the nori that need rice, but my goodness this made making sushi easy. 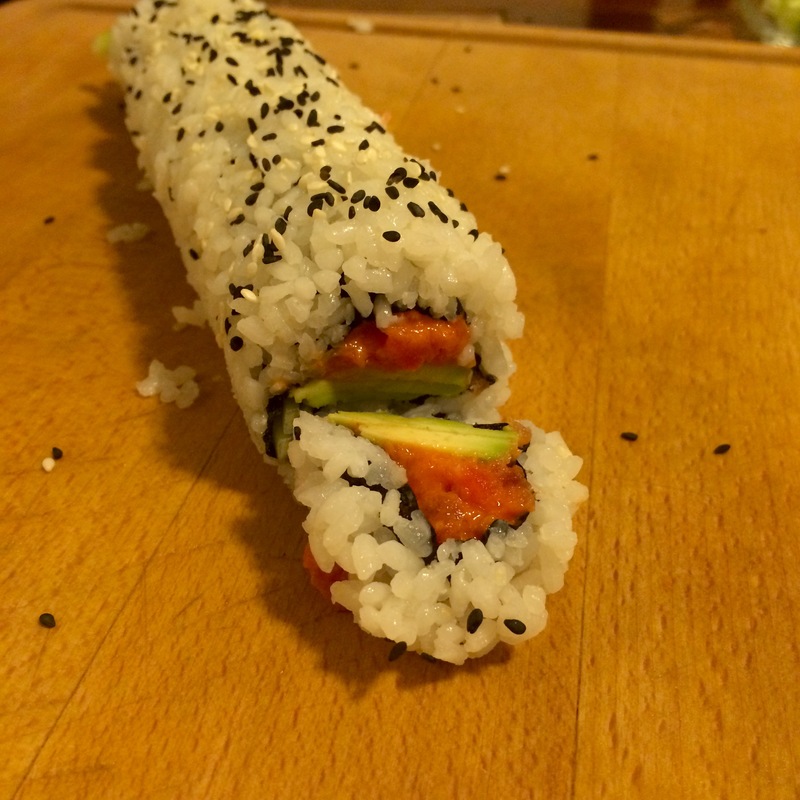 I’m not sure if I am excited about it or not, because with how much we like sushi, I feel like I am going to be spending a lot of money on seafood in my near future and experimenting with different sushi rolls. 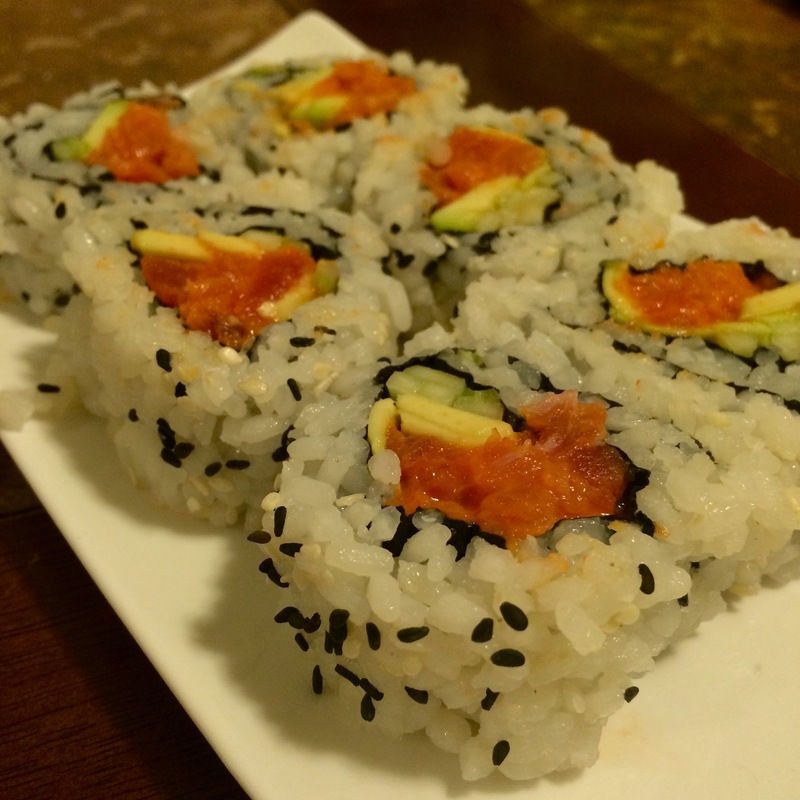 What is your favorite sushi roll? 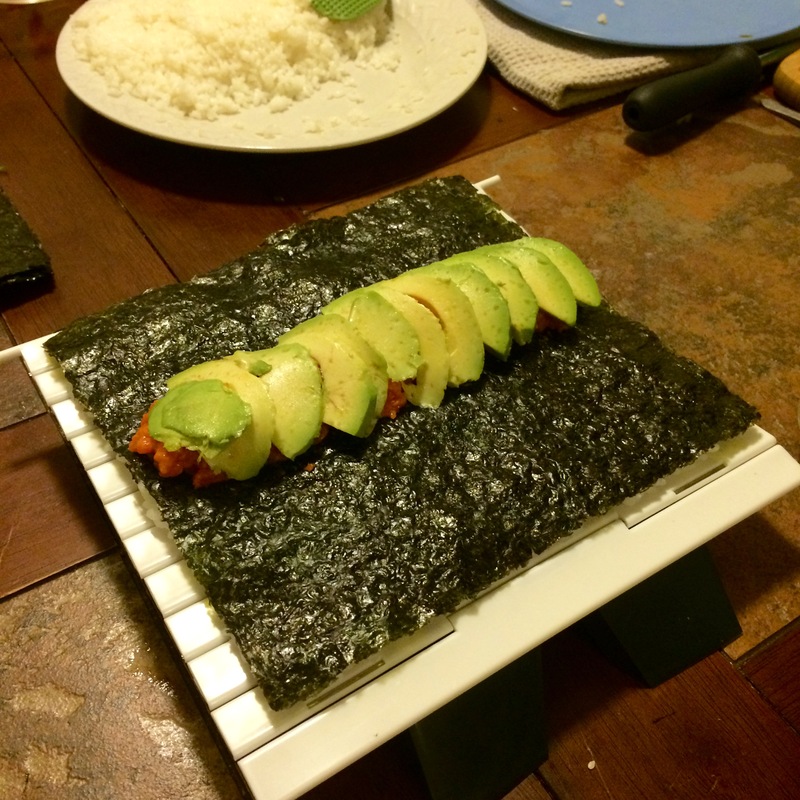 Would you be willing to try to make sushi at home? 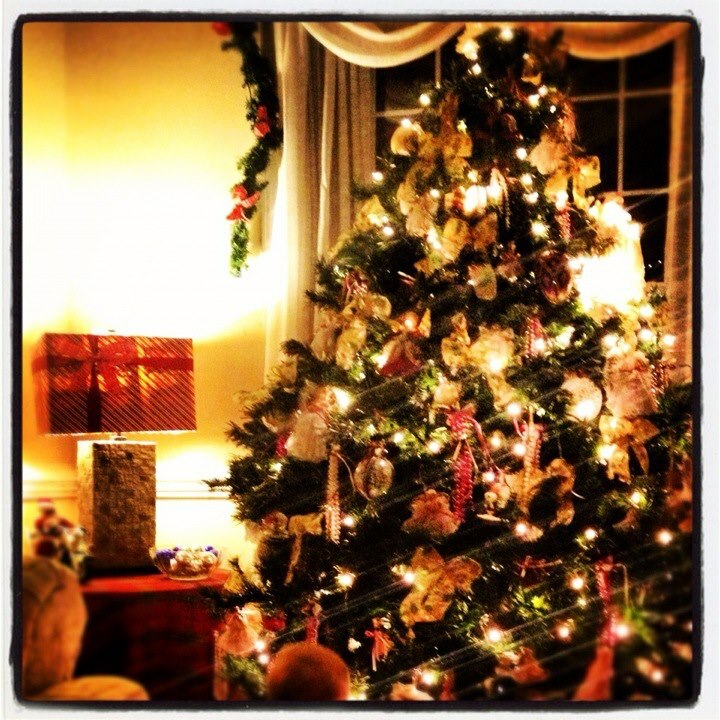 Share!